This tablet brings a display diagona of 10.1 inches with a resolution of 1280 x 800 pixels and 16.7 millions colors. Motorola relied on simplicity an because of that you will only find on the superior side an 2-megapixel sensor. Laterally at the base are positioned the HDMI connector, the charger jack and the microUSB. On the upper side are positioned the 3.5 mm headset audio jack, the SIM card slot and the microUSB. On the back of Xoom are positioned the 5 megapixel camera sensor that shoots HD with dual LED flash and autofocus and also an essential button that allows starting, stopping, locking and unlocking the TFT screen. Also there are positioned the stereo speaker that plays the sounds in an enjoyable way. It is not noisy and therefore the sounds are not distorted. The tablet corners are rounded, The back is made from metal and when you will hold it firmly in your hand, it will give you the impression of strength and quality. We are talking about a tablet with Nvidia Tegra 2 which brings an additional performance on the video processing. It has a dual core processor clocked at 1 GHz, 1 GB RAM, 32 GB storage and the microSD brings another 32 GB, Android 3.0 HoneyComb. Android HoneyComb is easy to navigate, especially if you had before a smartphone with Android operating system. It relies heavily on some 3D effects from photo gallery. If you read the reader with Feedly, for example, it will become a pleasure. You will say that you are browse a digital magazine with unlimited content. 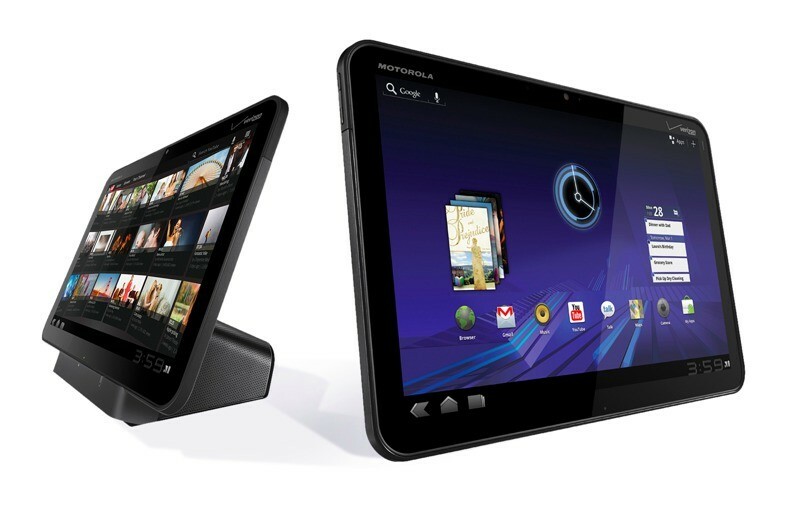 Motorola Xoom brings Wi-Fi in standards of b/g/n, Bluetooth 2.1, microUSB, HDMI, GPS, 3.5 mm jack. A big advantage of the Xoom is the browsing which works without interruption. Even the MacBook Air is not as fast and naturally in rendering the web pages. This is not a free compliment and you will draw the same conclusion when you will see how Motorola Xoom will load a website mfull with flash banners, faster than your computer or notebook. The 5 Megapixel sensor positioned on the back records HD at 720p with 30 fps. Application for the photo camera from standard brings a wealth of options. Because of its dimensions, is not recommended to use it as a camera or camcorder. The 24 Wh of the battery are well optimized to provide a minimum 8-9 hours of intense use.